Campamocha is Spanish for Praying Mantis. I like the word. After researching this insect, I feel facts and symbolic connections are a bit out of synch. It may be that the symbolic associations are purely visual. I must say though it’s one odd-looking bug. It’s a cousin to the termite and maybe a prototype of the cockroach. it is the oldest symbol of God. …. could this be why we found this one staring at us from a bottle of wine…. Since I began working on this insect series I have received emails that include photos of exotic bugs, names and web sites of artists who depict bugs and many interesting reads. I know many of your favorite bugs : cute and ugly. 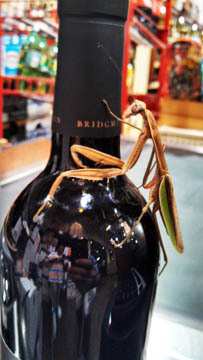 I’ve been visited by a number of insects whom I’m sure wish their presence known (la campamocha en la botella de vino). All the bugs I drew made some personal connect via a friend or were direct. I appreciate it all. If we could learn to respect the smallest of life it would certainly be a better thing all the way around. The most recent link I received reminded me of the Insect People from the Navajo Creation Myth: Insects in Art and Religion of the American Southwest. This entry was posted in art and tagged art, bug, campamocha, casein, collage, insect, phoenix map, praying mantis by monica. Bookmark the permalink. I am looking at this website for the first time and I did not know how much I have missed until now! Bug series?? Chase has always loved, respected, adored and been fascinated by bugs (as you probably remember being our neighbor). They seem to speak to him. He understands them, innately. He especially loves the Praying Mantis. He spent a years’ worth of allowance and money from Grandma ordering these creatures one after the next from a website. He shed tears when they inevitably died, sometimes en route. He would study them, create worlds for them, try to understand them. On the first day in our new house last summer, he went outside and found to his immense surprise and delight, a large green Giant praying mantis sitting motionless (as they do) on the green of a leaf of a plant in the backyard. It was like he was there just to greet Chase. We went back out after dinner and it was no longer there and we never saw it again. Hi Teri, Chase loves bugs…well of course he does! You can tell him what the praying mantis is called in Spanish now. I’ve always liked the word. I am invited to participate in a bug exhibition, called Jeepers Creepers. It will be at the i.d.e.a. Museum in Mesa, in October, I believe. It’s in conjunction with the Entomology Dept. at ASU. He’s bound to enjoy that you know. And if you go you can see the paintings in person too. Thanks for visiting my blog Teri. ps … fyi … praying mantis and cockroach …. related you know.